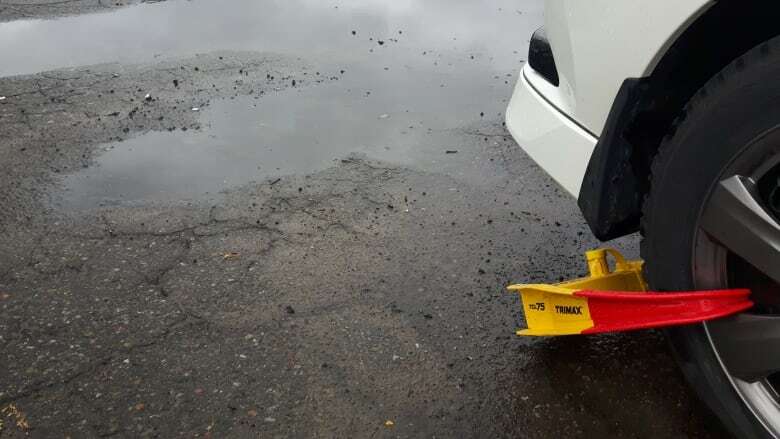 At least one hotel in Montreal's West Island is offering guests wheel clamps to prevent their vehicles from being stolen, so great is the problem of car thefts from hotel parking lots near Trudeau International Airport. Hotel parking lots along Côte-de-Liesse Road. At the Fairview shopping centre in Pointe-Claire. Since 2015, more than 650 cars were reported stolen from these areas. The area around the airport is a prime spot for thefts because there are so many parking lots where cars are left for days at a time. "It's simple. Car thieves go where there are lots of cars," said Montreal police Insp. André Durocher. The Travelodge on Côte-de-Liesse began offering guests wheel clamps, commonly known as Denver boots, this year. "All our members have put in place a number of measures to prevent car thefts on their parking lots, from cameras, increased lighting, security guard, fences, gates and so on," said Ève Paré, the chief executive officer of the Greater Montreal Hotels Association. However, ramping up security doesn't seem to be having much of an impact on thefts, Paré said. "They've been arresting people but it keeps coming back. It's a very cyclical issue," she said. The dark red hexagon on this map represents the area around Côte-de-Liesse Road, a growing hot spot for car thefts. Click on the map for a detailed look at where crimes happen in Montreal. A year ago, in April 2017, Montreal police nabbed five men suspected of running a car-theft ring in the West Island, however, the number of thefts have actually increased since those arrests. On average, 311 cars are reported stolen each month. Last November, however, nearly 400 car thefts were reported — the highest monthly number since police started releasing detailed crime data in 2015. Although vehicle theft is on the rise, it is actually one of the least frequent property crimes in Montreal. Montreal police crime data shows that, by comparison, there are on average 760 break-ins into homes or businesses and 610 thefts of objects such as laptops and purses from inside cars reported to Montreal police each month. Paré understands that because vehicle thefts are a less frequent crime, they are not a priority for police. However, she's worried about the impression it leaves on tourists. "We're really concerned about the image this gives to Montreal," Paré said. "You come to Montreal, you go to a hotel and your car gets stolen." Police advise car owners and travellers to choose hotels that offer heightened security before parking their cars in a hotel lot and jetting off. They also urge motorists to cover the serial numbers on their cars. Thieves can use illicit technology to make copies of keys.